Mitchell Marsh celebrates after claiming a wicket. 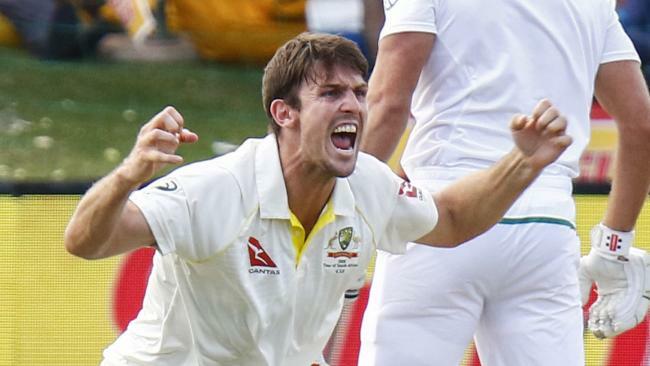 THE past 12 months have seen quite the transformation for Mitchell Marsh, who has gone from fragile middle order target to Australia's versatile batting option. And now it appears the pace and guile is back in his bowling, adding a further string to his bow as Australia's all-rounder. A shoulder injury sent him home from India early and forced the man dubbed a future Test skipper by several former greats to shelve his bowling duties until the end of the year. But he returned, and was able to contribute useful overs during the Ashes - even if they came at a reduced pace and without any scalps to his name. In South Africa, however, the wickets have returned. The needle was cranking up to 145km/h. Reverse swing in full effect. 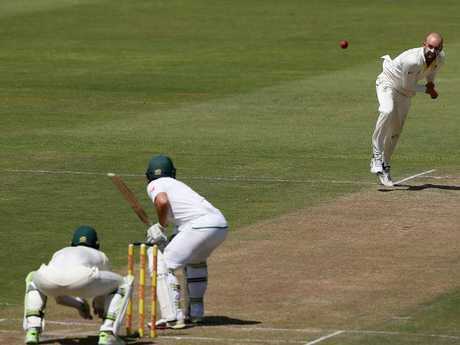 In the first Test in Durban Aiden Markram and Quinton de Kock had added 147 for the sixth wicket, giving hope to an unlikely home victory and sending some nervous shockwaves through the Australian camp. Smith turned to Marsh, and was rewarded with the breakthrough wicket of Markram, with Australia running through the tail to secure a 118-run win. Again, on Saturday, Australia felt the match slipping away with AB de Villiers and Faf du Plessis coming together at the crease with the tourists' first-innings lead evaporating. Australia's frontline quicks were bowling heat but couldn't dent the defences of the South African veterans. Marsh, however, drew a false stroke from du Plessis and the South African captain was sent packing for nine - but not before burning a review. The West Australian then doubled down with a second LBW, this time of Theunis de Bruyn, to have two wickets in two overs. Not bad at all from a man forced down the batting order just 24 hours earlier because of a battle with gastro. THE impact of Kagiso Rabada's series-ending suspension for his day one brain explosion, where he shouldered Australian captain Steve Smith, will be felt on more fronts than just his own devastating on-field exploits. Rabada will miss the third and fourth Tests of the series unless he is able to have the two-Test ban overturned at a hearing with the match referee Jeff Crowe, which is set to take place after play on Sunday - having been pushed back 24 hours due to umpire Chris Gaffney being struck down by gastro. To do that he'll have to convince the hearing that his shoulder contact was accidental, rather than intentional as the ruling handed down on Saturday indicated. But more than that, it could potentially destroy the balance of the entire Proteas XI. The ideal replacement for firebrand Rabada is all-time great Dale Steyn, who has missed the opening two Tests as he recovers from a foot injury. Steyn has returned to the nets and is eager to prove his fitness for the third Test in Cape Town - but would present an obvious risk, given his recent injury woes. It's likely South Africa, who have carried five bowlers in the same line-up in recent times, would want some insurance in the team to cover Steyn should he break down again. That could lead to a recall of towering, retiring quick Morne Morkel - which, in turn, could result in middle order batsman Theunis de Bruyn falling by the wayside. Morkel was dropped for the second Test - replaced by youngster Lungi Ngidi - after a lacklustre performance in Durban, where he had figures of 0-75 and 3-47. The 33-year-old will retire from Test cricket at the end of the Australian series. In short, the impact of Rabada's suspension could lead to massive structural changes to the Proteas XI - and his loss will be felt on many fronts. NO batsman has looked comfortable on this Port Elizabeth pitch. No one except AB de Villiers who, quite simply, has been the best batsman to stand on this wicket the past two days - and that includes the world's top-ranked batsman. David Warner, who topscored for Australia with 63, played one of the more bizarre knocks of his career as he fought through a tricky opening session and was at one point 8 from 36 deliveries. No other Australian - including the world's leading Test batsman Steve Smith - looked more at home than Warner, who admitted he rarely felt completely set in the middle. South Africa were the same, with Dean Elgar and Hashim Amla scratching out an 88-run partnership in excruciating fashion. And then de Villiers arrived at the crease. This bloke is different gravy. South Africa’s AB de Villiers plays a shot during day two. When teammates were struggling to find anything but the edge of their bats, de Villiers responded with a stunning counterattacking half-century to wrest control back in the home side's favour. He turned what could've been a tricky period into a cakewalk and handed the Proteas a first-innings lead on a platter - while never looking troubled. Such was Australia's desperation to get his wicket, Smith ordered an optimistic review of a catch which ballooned off de Villiers' arm from a sizzling Pat Cummins' bouncer. 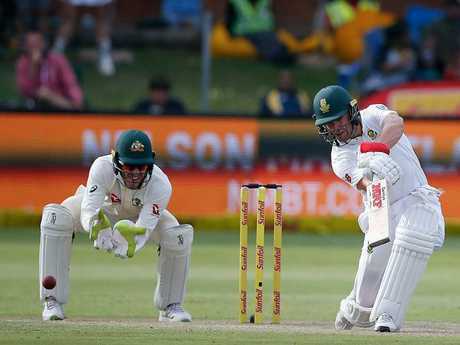 De Villiers finished the day unbeaten on 74 with 14 boundaries, continuing a fine series for the classy right-hander who paired an unbeaten 71 in the first innings in Durban with a match-changing run-out for a duck in the second. FOR large periods of play on Saturday, it appeared Nathan Lyon was a mere passenger as the Australian fast bowlers rotated in an attempt to blast their way through the Proteas' batting line-up. For 39 overs he sat by and watched as Starc, Hazlewood, Cummins and Marsh attacked. It had followed a similar delivery which drew a leading edge - so on the second attempt, de Kock played inside the ball and watched in horror as it gripped and turned past his bat. With South Africa to bat last on this wicket, Lyon's eyes will have lit up as he sees the ball grip and rip in the rough. He - as well as South Africa's Keshav Maharaj - still have huge roles to play in the coming days. Australia's Nathan Lyon delivers the ball to South Africa batsman Dean Elgar. IT was anything but pretty, but Dean Elgar's epic 197-ball stay at the crease was at least a masterpiece in perseverance. The left-handed opener survived through three sessions on a wicket that was hard to score on, playing what at times appeared to be an innings of cruel punishment. His innings was a mix of nicks, nurdles, edges and blocks. Oh, and six boundaries - from nearly 200 deliveries. During a gruesome middle session just 43 runs were scored Elgar combined with Hashim Amla (56 from 148) as cricket was played at a snail's pace. That's Test cricket, although former West Indian great Michael Holding was less impressed with the 30-year-old's 11th Test half-century - arguing he'd wasted the most generous batting periods of the day. Holding pointed to the free scoring of nightwatchman Kagiso Rabada, who scored 29 from 40 at a far superior runrate of 72.50 compared to Elgar's 28.93. The champion West Indian quick suggested the Proteas' middle order of de Villiers and du Plessis had been placed under pressure by Elgar's go-slow. "With all the football talk going on today, I'd say South Africa scored an own goal in that second session," Holding said, referring to the big Premier League clash between Liverpool and Manchester United which dominated the cricket commentary at times. But as they say, beauty is in the eye of the beholder. And Elgar's 57 was surely beautiful to someone out there. "He wasn't anywhere near his best but he just did not give it away," former Australian captain Border said. 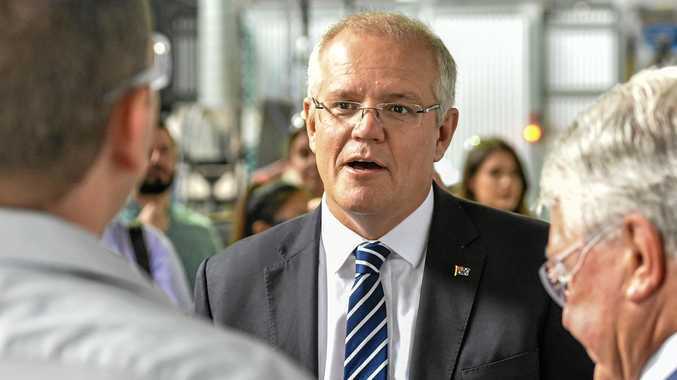 "And while they were very, very slow in that middle session they hadn't lost a wicket and were getting closer and closer to that Australian first-innings score. "After the event you think 'maybe they could've pushed it a bit harder' but give credit where it's due, he's made 50, opened the batting, he wasn't in his best form. But he's helped South Africa into a reasonable spot."